Bellator MMA returns to WinStar World Casino and Resort in Thackerville, OK on March 23 (AEDT). The event on Paramount Network, and simulcast on DAZN, features the four-fight main card following the preliminary card comprising ten bouts. In the main event former featherweight title contender Emmanuel Sanchez (17-4) faces Georgi Karakhanyan (28-8-1, 1 NC) for the second time. The latter replaces previously announced Ashleigh Grimshaw. Sanchez and Karakhanyan first met early 2017 at Bellator 170 in Inglewood, CA, where “El Matador” took the win by majority decision. Also on the main card a heavyweight battle between Linton Vassell (18-7, 1 NC) and Valentin Moldavsky (7-1). In addition, a pair of middleweight matchups kicks off the action featuring Gerald Harris (25-7-1) up against Anatoly Tokov (27-2), and Norbert Novenyi (2-0) face off Will Lavine (1-1). Middleweights Johnny Eblen and Chauncey Foxworth battle it out on the top of the preliminary card. The rest of lineup includes a series of MMA bouts featuring male and female competitors. 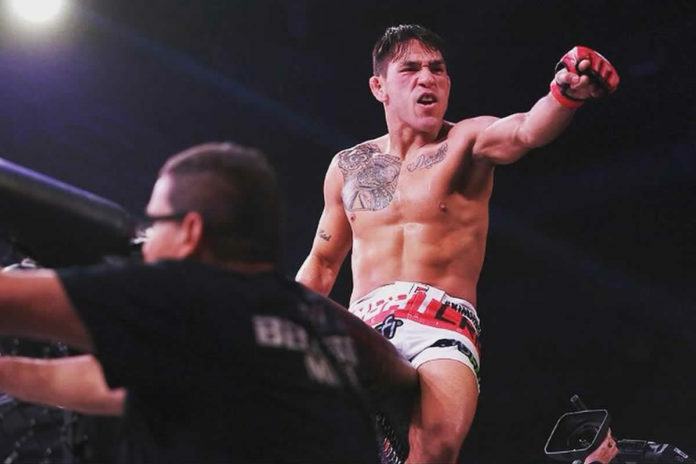 The complete Bellator 218 fight card can be found bellow.